You have probably had a year of ups and downs. That is, after all, pretty much standard. However, on a global scale 2017 won’t go down as a feelgood classic. There have been terror attacks, natural disasters, and a political atmosphere where everyone seems to hate everyone else You Can Now Endorse Presidential Candidates on Facebook You Can Now Endorse Presidential Candidates on Facebook You can now endorse your choice to be the next President of the United States on Facebook. That is if you like annoying your friends. Read More . It’s against this backdrop that social media sites are publishing their reviews of the year. And Facebook is no exception. Facebook has not only produced its own Year in Review, it has also made little videos for every one of its users. Whether or not they want to be reminded of 2017. 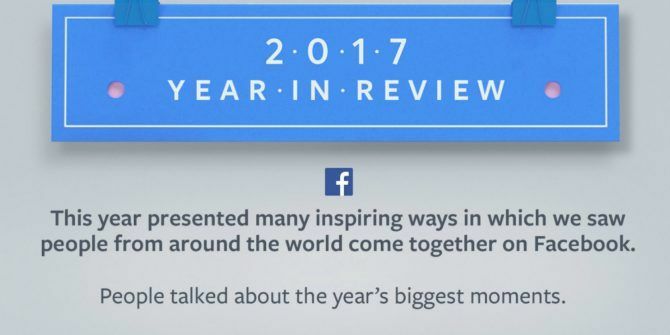 Facebook’s Year in Review highlights the moments people spent time discussing in 2017. Which were International Women’s Day, Super Bowl 51, and the Las Vegas shooting. While two of these three events can be described as positive, the Las Vegas incident is the deadliest mass shooting committed by an individual in the United States, with 58 people dead and 546 injured. We’re also reminded when “people came together to support one another in times of crisis.” Which were the earthquake in Mexico, Hurricane Harvey, and One Love Manchester in response to the Manchester Arena attack. While you could argue that these show the better side of humanity they’re also all reminders of just how many people were caught up in horrible events this year. As if the world’s problems weren’t enough to worry about, Facebook has produced a short video showing you your own personal Year in Review. Facebook’s heart is in the right place here, but if your 2017 has sucked then the last thing you want is to be reminded of the horrible things that have happened over the past 12 months. Especially when it’s all set to cute and cuddly music. Facebook’s Year in Review for 2017 demonstrates the way social media is changing. We once used it to share little snippets of our lives, but we’re now just as likely to use it to discuss the crisis/tragedy/horrors of the day. It’s no wonder Facebook is trying to help prevent suicides Facebook Is Now Using AI to Help Prevent Suicides Facebook Is Now Using AI to Help Prevent Suicides Facebook is ramping up its efforts to help people having suicidal thoughts. And the social network is using artificial intelligence to identify people at risk. Read More . Have you personally enjoyed a good 2017? Or has 2017 been a struggle for you? What do you think of Facebook’s Year in Review for 2017? Does it accurately reflect the year we’ve just had? Or should Facebook have focused on other events? Please let us know in the comments below! Worst year ever - personally and globally, there has been so much death and destruction. Devastating. Bring on 2018!! Facebook needs to mind it's own business.It's why I don't use it hardly ever anymore, started out great, has become a monster.